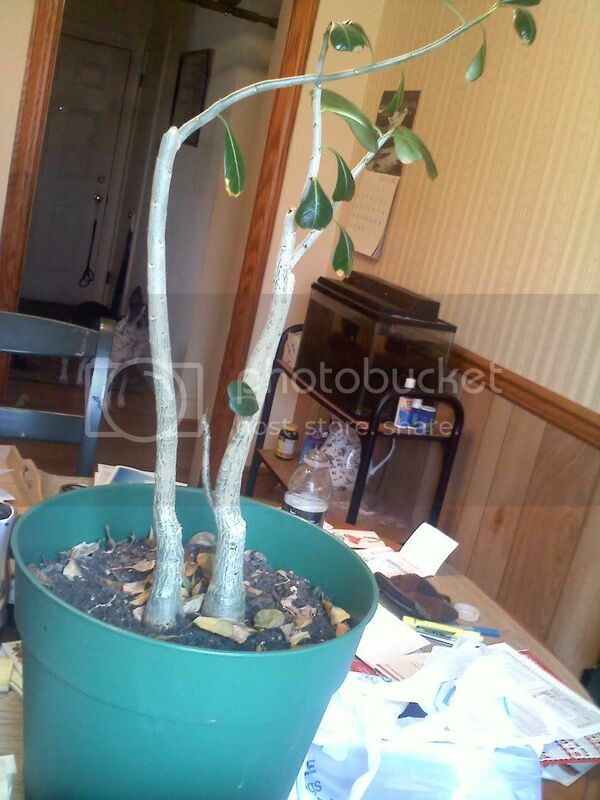 Hi, I need some advice for my Desert Rose plant. I absolutely love this plant, mostly because I bought it from a man at the farmer's market who was so passionate about plants and recently passed away. I also just really love Desert Rose plants. My plant has had its ups and downs, and about a year ago I cut a few of its limbs off in hopes that it would fatten up at the bottom. It has responded very well to plant food in the past (I read that Desert Roses generally do), but has grown these skinny limbs off of the places where I pruned it. It has never bloomed and I keep it in a sun room in the summer time where it thrives. Should I prune it again? If so, when and where? Any advice is greatly appreciated! Have a great day! Is that 2 plants in the container? The soil sure does look peaty. They came attached together like that, so I am guessing that it is just one plant. Can you explain what you mean by "peaty?" Peaty- meaning the soil looks like regular potting mix with mostly peat. DR's do not like wet feet (soggy). I haven't pruned the upper half, but I have pruned the roots on my DR. I have read that pruning hard in spring for lanky growth above the graft every 2 years to force flowering. How much sunlight does it get? DR's need direct sunlight for sustained growth , below 50F-don't water as it will go dormant.